The American TFP > Events of 2007 > We Came, We Saw, She Conquered! The Public Square Rosary campaign began with a discussion about commemorating the 90th anniversary of the last apparition at Fatima when Our Lady performed the Miracle of the Sun. Its organizers tried to think of a special way to make this anniversary something special and relevant. The idea of holding a rosary outside in a public place seemed a natural response to the Fatima call for conversion, penance, prayer and, especially, the recitation of the rosary. It would serve also as a response to a culture that increasingly banishes displays of faith from the public square. Thus, the Public Square Rosary was born, and the idea spread like wildfire. Six months of intensive planning followed. Grassroots organizers set up local rallies. 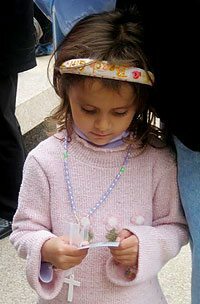 When October 13, 2007 arrived, the American Society for the Defense of Tradition, Family and Property (TFP) and its America Needs Fatima campaign could announce that well over 2,000 Public Square Rosary Rallies were held across the United States. People from around the country gathered in public squares to ask Our Lady for the conversion of America. 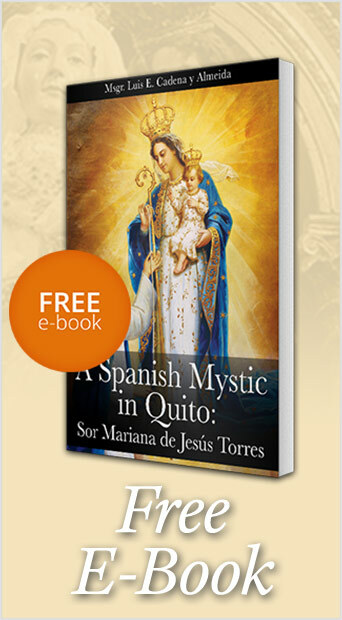 The rallies had a concrete purpose in mind – to ask Our Lady for the conversion of America. Participants invited passersby to pray for this intention. They implored the end of sins that offend against public morality. They prayed for the Blessed Mother’s triumph promised at Fatima! Perhaps even more importantly, the campaign was a public witness of the Fatima message, which is so contrary to the secular view that religion is a purely personal matter for the weak and old-fashioned that must be kept behind the Church doors. In John Haffert’s book, Meet the Witnesses, the Catholic writer affirms that an estimated 70,000-100,000 came to Fatima on October 13, 1917 to witness the Miracle of the Sun. On October 13, 2007, it can be reasonably affirmed that an estimated 70,000-100,000 Catholics went out into to the Public Square in America. 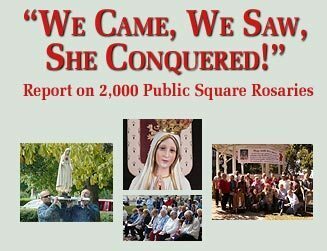 With over 2,300 Rosary Captains committed to organizing these events, the mere scope of these rallies was mind-boggling. With the help of the campaign’s central office near Topeka, Kans., Rally Captains received all that was necessary to organize their own events. Downloadable posters and programs were also available online. News of the rallies spread quickly and to such an extent that there were rallies in every major city. Rally locations were published on the TFP website so that participants could find the nearest one. An impressive network was formed in which local organizers would meet nearby Catholics they never imagined existed. Organizers were also pleasantly surprised to find visitors from other states join their ranks on the streets. The public squares chosen by Rally Captains were often some of the most symbolic places in the country. One Public Square Rosary Rally took place on Fifth Avenue in front of Rockefeller Centre in front of St. Patrick’s Cathedral in New York City. Nearly 500 people bore public witness to the Fatima message and even knelt on the crowded sidewalks of one of the world’s most famous avenues. However, that rally alone did not represent the huge city. There were an estimated 100 Public Square Rosary Rallies scheduled within a 50-mile radius of the Fifth Avenue event. Another symbolic place was Lafayette Park right across from the White House. Nearly 120 people attended a rally in this park that has long heard the chants of pacifist and ecologist protesters, but now heard prayerful entreaties to Heaven. Congresswoman Mary Fallin (R-Okla.) joined the rally and prayed the rosary. Similarly, seventy-five participants braved intermittent rain at the Gateway Arch in St. Louis and another group stationed itself in the middle of Jackson Square in New Orleans. 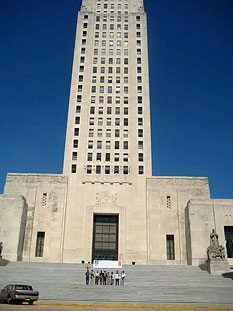 Public Square Rosaries were prayed at the state capitol buildings in Kansas, Maine, Missouri, Texas, Louisiana and Indiana. Over 300 people gathered at the Capitol in Harrisburg, Penn. and 400 attended a similar event in Sacramento, Calif. Rallies were held in some of the most sybolic places in the country. Here participants gather at the Hollywood’s Walk of Fame. “The Rosary Rally in Hollywood was held in front of Grauman’s Chinese Theatre at noon. Ten zealous souls showed up. This wasn’t bad at all since I just decided to lead the rally a week ago.” The group prayed the rosary and other prayers and gave out Catholic literature. They also exchanged contact information and agreed to come back to Hollywood regularly to distribute rosaries and literature. In a similar vein, about 900 people attended the 12 Public Square Rosary Rallies in the Las Vegas area – several of them in front of famous casinos. In some, the Knights of Columbus participated in full regalia. The area’s Mater Dei Chapel had a special pre-public rosary service that was filled to capacity. It included Adoration of the Blessed Sacrament, a talk about the history of Fatima, and Benediction. The people then proceeded to the public rosaries all over the city. Many rallies were attended by hundreds of participants. Throughout the day, success stories were abundant. Many Rosary Captains sent reports manifesting their joy and enthusiasm at honoring the Blessed Mother. Size made little difference, since even the smaller rallies were big in enthusiasm. The size of the rally made little difference. Even at smaller rallies, participants were big in enthusiasm. Organizing a rally was not easy. The participants faced obstacles and problems. Many felt inhibited to appear in public. False rumors circulated about the rallies. Weather conditions were often far from ideal. Organizers and attendees overcame these obstacles, often with heroic persistence. They demonstrated a refreshing seriousness, determination and inventiveness that stemmed from their most important possession – their love and devotion to Our Lady. Far from fearing to pray in public, many gloried in finding the busiest spot to appear. Not all rallies went smoothly. Some were plagued by bad weather and adversity. Far from discouraging participants, it only strengthened their resolve. Others reported winds so intense that their banners were shredded into pieces. The rallies were an occasion of grace for participants of all ages. One of the most impressive aspects of the Public Square Rosaries was the graces Our Lady gave on that day. Everyone sensed her special protection. All felt fortified to do what needed to be done and were effusive in giving thanks to the Blessed Mother for the opportunity to honor her. Man’s efforts are insignificant in themselves. But with the aid of Providence, a simple witness became a massive and beautiful event reinforcing the belief that God can intervene and hear the prayers of the faithful. These prayers and future public prayers may not have immediate consequences but they might weigh heavily for the future of the nation. 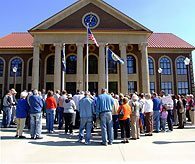 This entry was posted in Events of 2007 and tagged America, Blessed Mother, Fatima message, Meet the Witnesses, organizers, Our Lady of Fatima, Public Square in America, public square rosary, rallies, rosary, She Conquered!, Topeka Kansas, We Came, We Saw by John Horvat II. Bookmark the permalink.